Recently, I’ve heard a lot more conversation about demand generation and lead generation than I have for some time. Unfortunately, it’s been caused by people treating the terms like synonyms. While this is certainly a topic where I get more geeked up than the average businessperson, the difference is important enough that everyone involved in growing a business should understand it. At its simplest, the key difference between the two is that lead generation is really a subset of activities that lie within the demand generation process. DemandGen encompasses the entire revenue creation process, from generating awareness and interest through lead generation and to the bottom of the funnel where sales qualified leads (SQLs) are managed by the sales team. On one hand the fact that terms like “content marketing,” “inbound marketing,” and “lead generation” have become common vernacular is good news however, the implementation of these strategies is all too often ineffective. I’m beginning to see early signs of “inbound fatigue.” Companies are creating content, implementing inbound and getting leads; but they aren’t moving the revenue needle. Increasingly, I’m hearing of companies giving up and going back to the cold call, spray and pray approaches of the past. A friend of mine, who runs an inbound marketing agency, was recently fired by a client after generating 817 leads in six months. While they blew away the initial expectations that were laid out, very few of the leads became real revenue generating opportunities. Their client thanked them for their efforts, told them they did an excellent job and that their services were no longer needed. Yesterday I was talking with referral source of mine, discussing a client of his that he’s working to introduce to me. The prospect is investing some real money in creating content and initiating a retargeting campaign. The problem is that while the content is interesting and I’m sure they’ll get people to fill out forms for some of it, it doesn’t really connect or align with what’s involved in turning them into sales opportunities. A client of mine was just at a summit that focused on demand generation. He tweeted that according to the panel he was listening to, 70% of the content a company generates should be focused on the top of the funnel. I totally agree with that (and would like to point out that all too often the top is neglected). 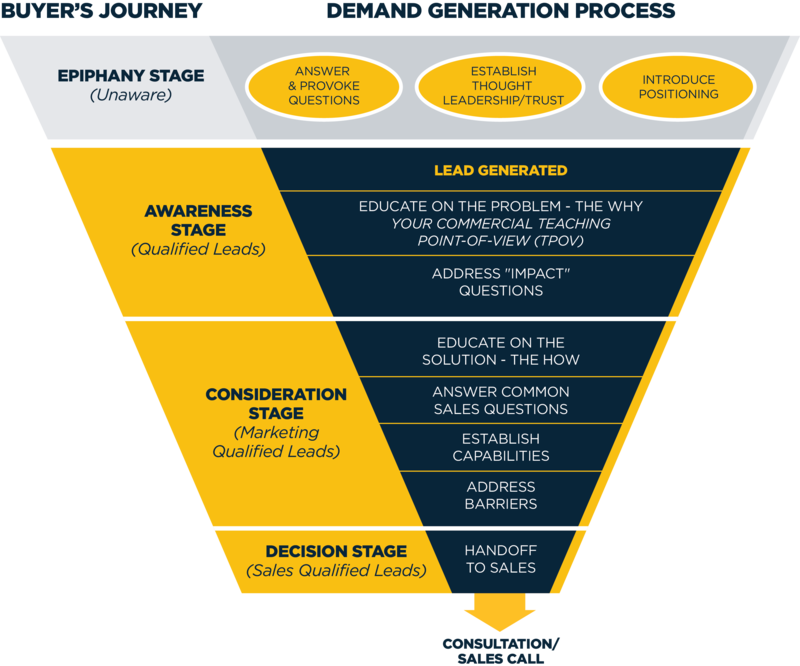 At first glance, this may seem to conflict with what I just said, after all, isn’t the top of the funnel all about generating the lead? Of course the answer to that question is yes. Leads are the raw material for growth. However, if you want to monetize that raw material you must take a holistic view of the process that turns leads into loyal, high profit customers – and that is precisely what demand generation is all about. The failure to focus on, define and support a comprehensive DemandGen process is akin to drilling for oil without thinking about how you’ll refine it. When the focus is on demand generation, the issues I shared above won’t take hold. The content you create above the funnel will connect with the content and conversation your salespeople are having at the bottom of the funnel. Your lead nurturing tracks will pick up from the lead’s interests and seamlessly introduce the business issues, problems and impacts caused by the status quo. The scripts and emails your sales development team use will enable the lead to be managed properly and handed-off effectively. If your organization isn’t looking at and managing the process from the beginning to the end, then the likelihood of disruption and even failure increases dramatically. The demand generation process is strategically and tactically agnostic. Those who know me well know that I’m not really a believer in inbound or outbound models – I’m a believer in allbound. With a DemandGen focus, you won’t get lost in philosophies, strategies or tactics. The truth for most b2b sales organizations is that no single channel, mode or strategy is enough to create a customer. You may initially expose your products to prospects at a trade show, but they don’t become a lead until they download a paper. At the time they download, they may not be in a position to act, but at a conference something stimulates a need and they run into one of your sales reps in a breakout session. That conversation leads them to do some research online and they reach out to associates who have dealt with the issue before. That finally leads them to engage in a sales process with you. Prospects switch between online and offline modes instantaneously, without even thinking about it. If your efforts - all of your efforts – aren’t aligned you fail. When I see companies who have failed at inbound or any other approach, it’s rarely caused because the strategy is the wrong one for them. It’s caused because they hadn’t fully fleshed out how to make the effort translate to revenue. Develop a demand generation process and make sure that doesn’t happen to you.